This next award was given to me by Bill over at Billablog, one of the first blogs I started following when I discovered this mad, mad world of blogging. The idea is to copy the picture, write seven interesting things about oneself, then invite seven other ’bloggers to do the same, linking to everyone involved. Now I've done a few award things lately so I don't think I will do the random 7 things about me. If you're new and you haven't read them before you can read some here and here. 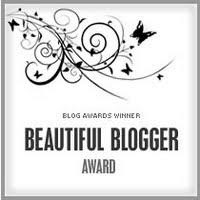 So all I'm going to do with this award is pass it on to 7 other bloggers, who's blogs I love. Check em out! Well done, I clicked through from ....um .... someone ...maybe Vicki or maybe Kellyansapansa. You know how it is when you get clicking. I love these photos and will enjoy reading your book reviews. Very well deserved Mrs P! And the awards just keep coming!!! Congrats, SO well deserved!! Thanks for the new blog list to peruse!